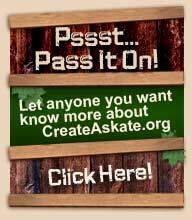 CreateAskate.org has teamed up with UPS to provide integrated shipping tools. When you are ready to have your items shipped, understand that all shipping and handling rates are based on U.S. rates from UPS plus handling. UPS ground is what these rates are based on and from the time of shipping, your package(s) generally arrives in 2-10 days.